The spectacular victory of the Serbian volleyball players against the strong Italian team on Sunday evening in Vienna lifted Serbia to her feet, and brought life back to the streets of Northern Kosovska Mitrovica. Columns of cars with Serbian flags, honking and with the deafening noise of firecrackers cruised the streets to the high barricade of gravel on the main bridge. The celebration of the unexpected triumph of the Serbian volleyball players for a moment released people’s accumulated adrenalin. In this part of Kosovo there has been heavy tension in the last five days since, after the announcement by Hashim Thaci and EULEX in Pristina, EULEX customs officers as well as one Kosovo customs officer were transferred to two administrative crossings with central Serbia, Jarinje and Brnjak, a move which was opposed by the Serbs. 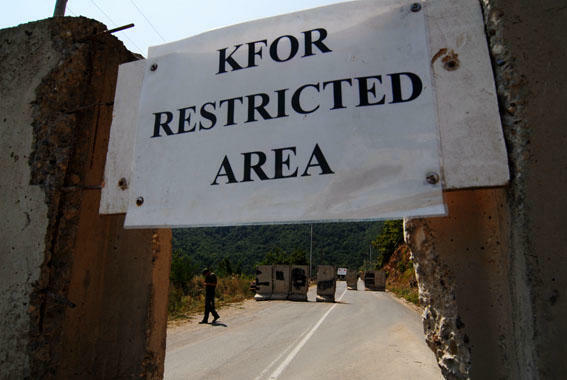 The Serbs blocked all roads from Pristina to the north, as well as the administrative checkpoints themselves, and KFOR completely closed traffic to central Serbia. This several day long stalemate was only partly alleviated by traffic via alternative routes - for Serbs, these are mountain roads, and for Pristina – by air. EULEX and the Kosovo government customs officers and policemen were lifted to the north of Kosovo by helicopter the morning of September 16, immediately after the expiry of an earlier provisional agreement on the status of the two administrative crossings. According to eye witnesses, in addition to transporting personnel and food, helicopters in the last two months have been transferring sandbags and barbed wire. Both sides are digging in their heels. German soldiers are reinforcing the administrative crossings with barbed wire and sandbags, while the Serbs are dumping gravel on existing barricades, some of them now up to five meters high. Long Serbian flags are draped across a pile of earth right in front of the soldiers, who are calmly keeping guard. The Serbs, who gather in small numbers on the barricades, are calm too. The population is waiting for the first sign of alarm to go out into the streets and to the barricades and prevent possible actions by EULEX and KFOR. The Serbs seem to be motivated, they say, to use civil disobedience to prevent the attempted integration of the North into the Kosovo system, and they claim they can continue living under a blockade for a long time. Many Serbs are aware that this is a "game of nerves" and that this demonstration of “passive strength” on either side could last a while. "It’s been years since we had a human life of dignity. We survived World War II at the hands of the Germans and the Albanians, then we Serbs in Kosovo were again oppressed. We can endure more because we are not really accustomed to anything better, and we will defend our homes," said an older resident of northern Mitrovica, Srbislav (73). Goods from central Serbia arrive infrequently and only via alternative routes but there are still no large scale shortages of basic supplies because people are using their reserves. Gas is not being bought at the pump. Traffic is ongoing although reduced in frequency in the municipalities in Northern Kosovo. Transport of medical patients is disrupted, and according to an unconfirmed report a heart patient died as a result of the fact that he could not be transferred to a bigger hospital in central Serbia. Before the announced action on September 16, which was described as D-Day for Northern Kosovo, many university students and staff from central Serbia rushed back to their homes in panic. "It is like the Serbs are in a pressure cooker," said chief Serbian negotiator Borislav Stefanović, who is presently in Northern Kosovo. "It’s tense, but quiet. The Serbs on the barricades are under heavy pressure and we are all patiently waiting for a response from Brussels to Belgrade’s plan to resolve the issue of the administrative crossings through dialogue", said Stefanović for the Belgrade daily "Press". A proposal for the solution of the most recent complex situation at the administrative crossings was sent from Belgrade to Brussels at the end of last week, at a time when the Kosovan prime minister Thaci and president Jahjaga left for a visit of several days to the United States, a country that strongly supports the actions of the Kosovan government. Serbia is still awaiting a response from Brussels. In September an agreement was reached between Serbs and Albanians regarding the customs seals, which had previously been a stumbling block, and caused the interruption of talks in July, the introduction of a customs embargo by Pristina on goods from Serbia, and a police operation by ROSU units in the North. For Pristina, Serbia’s acknowledgment of its customs seal is a recognition of Kosovo's sovereignty, while Belgrade’s response was that the seal bears the name "Kosovo Customs" instead of "Republic of Kosovo Customs" and is without any state symbols. Pristina announced it would be sending customs officials immediately after the expiry of the provisional agreement on tha administrative crossings, Jarinje and Brnjak, on September 16, which had foreseen KFOR involvement at these crossings in the meantime. Belgrade warned that no new talks on the administrative crossings had been conducted, and that the international community in Kosovo and the Pristina authorities would be responsible for possible consequences of unilateral actions. Serbia attempted to oppose the announced action from Pristina with harsh rhetoric, and active diplomacy. Although Belgrade had announced a package of measures, which was kept under wraps, the media leaked information that, aside from harsher rhetoric to ‘frighten’ its partners in Europe, the pro-European ruling bloc in Serbia in fact had no other strategy, and that the only instrument was held by the Serbs in the North themselves, i.e. how long they could endure the road blockades. The Serbian government, meanwhile, decided to bring the north of Kosovo back into its state tax system and begin charging VAT on goods going to Kosovo. Kosovo Serbs had so far been exempt from this tax when buying goods in central Serbia. The Belgrade government says that by including the north of Kosovo into its tax system it is actually trying to dismiss Pristina’s main argument about crime and smuggling in the north of Kosovo. With the help of Russia, a meeting of the United Nations Security Council was held behind closed doors on the latest situation where, despite the fact that no joint statement against the announced action from Pristina was adopted, according to media reports, there was a heated discussion among the leading countries. In Belgrade, political party divisions related to the north of Kosovo have been apparent since the beginning of the crisis in July. Opposition parties are accusing the government of "betrayal" of the Serbs in the north. Following the announcement of the 16th as a possible D-Day, the leaders of the opposition parties issued statements to numerous media teams at the administrative crossings in the north, in the presence of right-wing organisations, which part of the public interpreted as the "official" start of the political election campaign of these parties. The guests from Belgrade reached Kosovo via alternative routes and spent a day on the barricades. Conveying her impressions from this visit, the Serbian ambassador to Italy, Sanda Rašković-Ivić, said: "What I saw is reminiscent of those borders in Eastern Europe from the time of the 'Iron Curtain'. There is no traffic, only police and a multitude of signs to slow down, ramps. It is against this very Communism that the Western world fought, and NATO was formed in 1949 against it. Paradoxically, it is the same Western world, and NATO, that have created a typical Cold War frontier in the geographical heart of Europe." "Are there any Serbs in this room?" The atmosphere was further fuelled by the controversial Russian Ambassador in Belgrade, Alexander Vasilyevich Konuzin. On the day Croatian helicopters were transporting international and Kosovo police and customs officers to Brnjak and Jarinje, in Belgrade, at a security conference that brought together senior international officials, the Russian diplomat, in an unprecedented diplomatic way, gave an angry and emotional speech about how Serbia was not defending her interests and her compatriots in Kosovo. The now famous sentence, "Are there any Serbs in this room? ", further polarised the Serbian public. The Serbs on the barricades did not delve into a deeper analysis of the background, the moment and the behavior of the Russian Ambassador in Serbia that day, but they unanimously agreed that just the sentence “Are there any Serbs in this room?” sums up today’s Serbia and her attitude toward Kosovo. The tension and blockade of the North seem ominous. The Serbs would say that this is because they have never felt stronger pressure from the international community and the Albanians in Pristina and, at the same time, never weaker support from Belgrade.